The sale of 25 Loughrigg Avenue represents an excellent opportunity to acquire a substantial four/five bedroom property which was built in the 1930's. The property offers generously proportioned accommodation with three reception rooms and four double bedrooms. 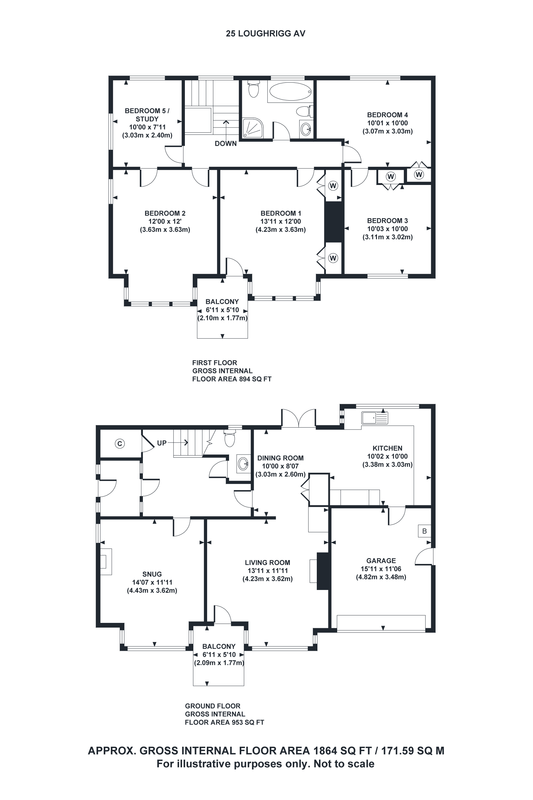 The fifth bedroom is presently utilised as a study although may be suitable as an additional bathroom. Improved by the present occupiers over the years with recent improvements including all new front double glazing, new boiler, cylinder and garage with electric rollover door. This all culminates a very welcoming home which may suit a variety of buyers whether as a ideal family/retirement property or alternatively as a fine second home. The property has an excellent rear private enclosed garden which enjoys beautiful fell and country views towards Loughrigg, Fairfield and Wansfell Pike, as well as enjoying a delightful sunny aspect. Externally the property has the benefit of private off road parking and an attached integral garage with electric rollover door. 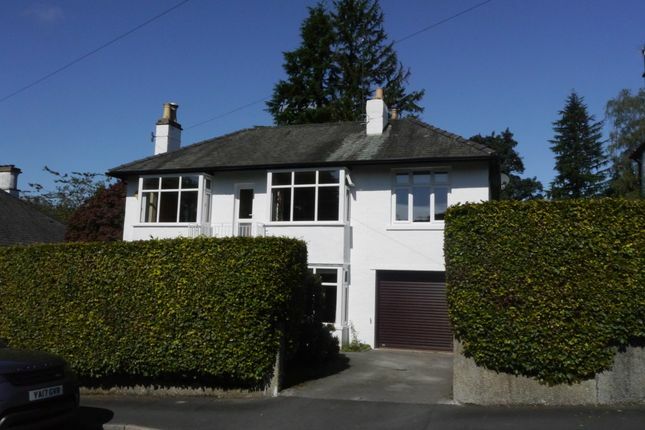 Ideally positioned and located, Loughrigg Avenue is a well established and highly popular residential area to the south side of Ambleside, with a reasonably level walk into the centre of Ambleside via either Lake Road or Rothay Road. A wide variety of amenities including shops, restaurants, cinemas, doctors, primary school and sports facilities are all close at hand. Directions From our office on Kelsick Road continue up the road and turn right into Lake Road, immediately into the left hand lane, proceed down Lake Road past the bp filling station and continue for approximately 200 yards turning right down Loughrigg Avenue. Proceed down and the property is on the right hand side. Hallway An attractive space with open staircase and cloakroom housing WC with wash hand basin and Brathay blue black slate tiled floor. Separate useful cloaks cupboard. Snug 14'07 x 11'11 (4.43m x 3.62m) Attractive dual aspect room with feature bay window giving attractive views across the garden towards the lower slopes of Wansfell Pike. Multi fuel stove set on slate heart with mantle. TV point. Living/Dining Room 13'11 x 11'11 (4.23m x 3.62m) Lovely dual aspect open plan room with feature bay window, period open fire with cast iron surround sat on a slate hearth with Oak mantle. TV point. Door leading to small glazed porch. The dining area has a selection of fitted drawers, display cabinet and cupboard with shelving. Double patio doors onto the terrace. Superb views across the gardens to Fairfield Horseshoe. Kitchen 10'02 x 10'00 (3.38m x 3.03m) A delightful bespoke kitchen with a selection of wall and base units with black granite worktop, upstands and inset drainer with stainless steel sink unit with mixer tap. Limestone tiled floor. Gas fired aga. Integrated dishwasher, fridge and microwave. Superb views across the garden towards Loughrigg. Landing With delightful window overlooking the garden. Front Bedroom One 13'11 x 12'00 (4.23m x 3.63m) Generously proportioned double room with fitted bespoke fitted double wardrobes. Feature bay window giving terrific south facing views towards Wansfell Pike. Access onto the private balcony overlooking the garden with panoramic fell views. TV point. Front Bedroom Two 12'00 x 12'00 (3.63m x 3.63m) Spacious dual aspect double room bay window. TV point. Excellent views from Wansfell Pike to Black Crag. Front Bedroom Three 10'03 x 10'00 (3.11m x 3.02m) Good size double room with built in wardrobe. TV point. Lovely views towards the lower slopes of Wansfell Pike. Rear Bedroom Four 10'01 x 10'00 (3.07m x 3.03m) "L" shaped double room with fitted wardrobes. TV point. Superb views across the garden towards Loughrigg and Red Screes. Rear Bedroom Five 10'00 x 7'11 (3.03m x 2.40m) Good sized single dual aspect room which is presently used as an office. This room could potentially be converted into an additional bathroom. Views across the garden. Bathroom Excellent and contemporary four piece white suite comprising of free standing bath, double corner shower cubicle, pedestal wash hand basin and WC. Fully slate floor tiled and partial slate wall tiled. Electric light/shaver point and heated towel rail. Outside The front is accessed by a private tarmacadam drive with small attractive shrubbed area with a delightful array of mature and colourful shrubs. Outside tap. Gated access around both sides of the property leading to a superb and delightful rear garden with paved terrace ideal for al fresco dining. Substantial lawn with magnificent views towards the surrounding countryside including Loughrigg, Red Screes, Fairfield and Wansfell pike. An abundance of well stocked borders providing a delightful selection of shrubs, bushes and trees. Summerhouse with views towards Loughrigg. Garage 15'11 x 11'06 (4.82m x 3.48m) Attached integral garage with electric rollover door with power and water. Housing wall mounted Valliant gas boiler, Mega flow cylinder, gas meter and electric meter. Plumbing for washing machine. Internal access into kitchen. Side door. Services All mains services connected. Gas central heating. Please Note The vendor of the property is a employee of Matthews Benjamin Estate Agents.